If you traveling to Japan and you thinking you are set to go, remember that even for Japan you need a Plug adapter. Japan has Type A outlets and you already research and found out that the this style also belongs to most of North America, so why would you need a plug adapter? 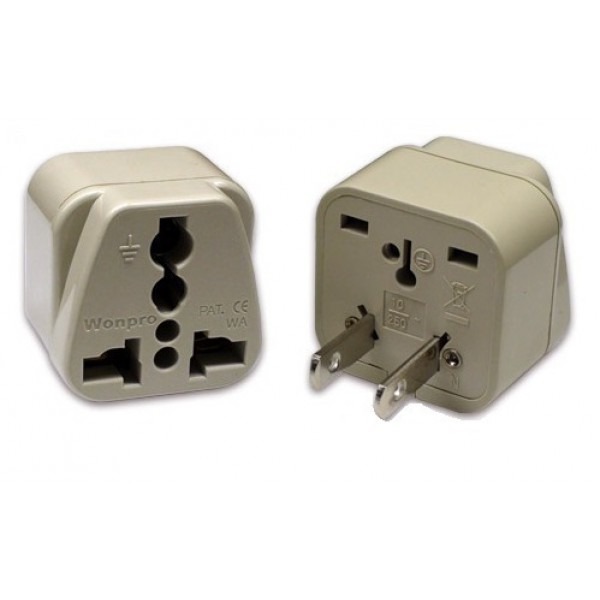 Well, even though America and Japan use the same type of plugs, American adapter are polarized. A polarized plug has a neutral prong receptacle which is wider than live prong receptacle, allowing the plug to be inserted in one way only. The Japanese plug doesn?t have the polarize receptacle feature, which therefore can be and issue when trying to plug a polarized US device to the Japanese outlets. The UNIV-6 will help resolved this problem for your dual voltage item such as camera, cell phone and tablets. The front of the UNIV-6 has a universal panel design to receive most plug types around the world. NEMA 1-15 power receptacles, are no longer allowed in new construction in the United States and Canada since 1962, but are still sold for replacement purposes. Universal grounded power plug adapter with the patented universal receptacle design that accepts plugs from most countries including the US and Canada.